obtaining 585 responses (a response rate of about 20%). Using this original data set, we investigate the role of social capital in maintaining mental health among the residents. First, we found the level of stress captured by the Kessler index (K6) to be unusually high compared both with people across Japan and with those who were displaced because of the earthquake and/or tsunami (but not the nuclear catastrophe). 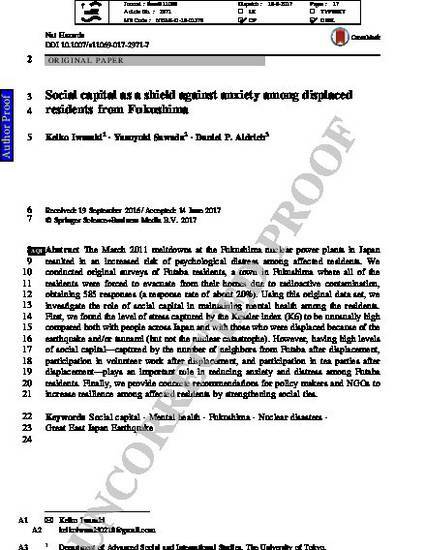 However, having high levels of social capital—captured by the number of neighbors from Futaba after displacement, participation in volunteer work after displacement, and participation in tea parties after displacement—plays an important role in reducing anxiety and distress among Futaba residents. Finally, we provide concrete recommendations for policy makers and NGOs to increase resilience among affected residents by strengthening social ties.